Representatives of New England’s six state police agencies are gathering in Vermont for a conference on law enforcement leadership. The focus of the gathering, organized by the New England State Police Administrators Conference, is on boosting women in the ranks of leadership. “We have room for improvement,” acknowledged Col. Chris Wagner of the New Hampshire State Police, saying his agency needs to do better when it comes to recruiting and promoting women. Women make up roughly 7 percent of the force, Wagner said, and none of New Hampshire’s current female state troopers has achieved the rank of lieutenant or higher. Wagner noted that the troopers he has spoken with don’t want to be promoted simply because they are women—but rather, the colonel said the women want to feel as if they have proven themselves as leaders in the organization. 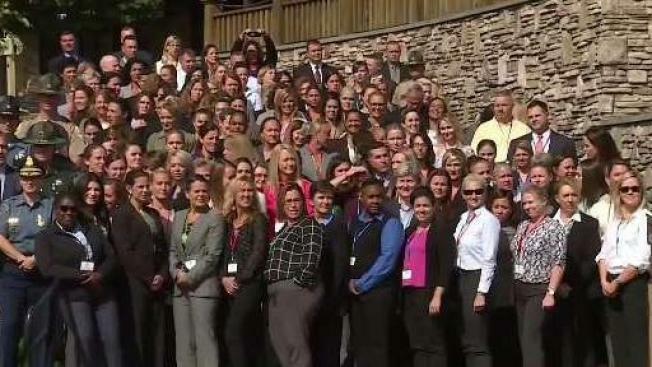 The NESPAC Women’s Leadership Conference at Vermont’s Jay Peak Resort has attracted more than a hundred female troopers from across New England, to attend training seminars and panel discussions. Several of the meetings are promoting professional mentorship, organizers said. The host state’s force is about 12 percent female, and also wants to become more diverse, said Maj. Ingrid Jonas of the Vermont State Police. “We’re better at our job when we ourselves represent the folks we are out there to promote safety for,” Jonas said of the goal to attract more women and minorities to careers with the Vermont State Police. Col. Kerry Gilpin of the Massachusetts State Police, who said her force is approximately 5 percent female, wants to raise that number and also restore public trust, after a series of scandals. Chief among them—several dozen Massachusetts troopers allegedly stole from taxpayers by padding their overtime. Gilpin told necn and NBC10 Boston she believes leadership traits often associated with women, including organization and interpersonal skills, should help with her goal to improve the reputation of the agency with the public. The NESPAC’s third annual women’s leadership conference continues Friday morning.